XK-Series Tool Holders which provide X, Y and Θ adjustments of hot air tool are designed to be mounted on a top platform of an SMT-ServiCE, X-1000 Series Under Board Heaters or XS ESD Base. The holder keeps an XHT Series Hot Air Tool in a vertical position for precise component removal and installation operations. 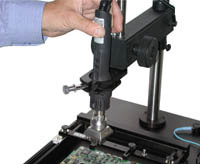 The hot air tool is held vertically to the work platform and bottom edges of any nozzle mounted on the tool are horizontal to a PCB, which is in a board holder placed on the work platform. 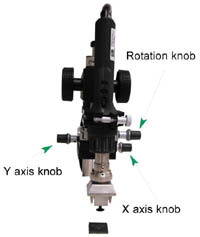 Rotate Z-axis Control Knob to raise or lower an XHT Series Hot Air Tool with a nozzle. 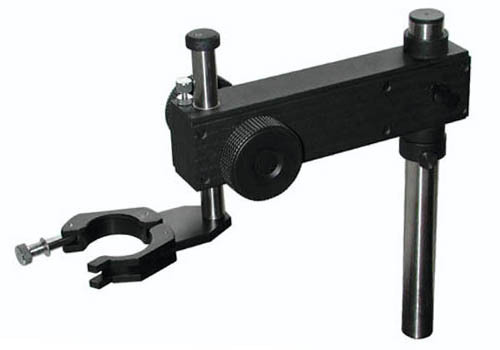 XK-4 -Tool Holder with fine X-Y positioning, rotation and up/down Z-axis movement (dual knob, for left and right-handed operators). 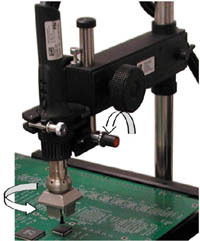 This unit allows fine alignment of a component with the corresponding land pattern on the board. 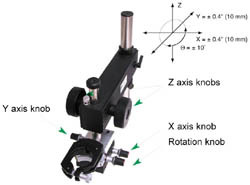 XK-3 - Tool Holder with precise rotation and up/down Z-axis movement (dual knob, for left and right-handed operators). Allows rotation of a hot air tool (and a component held by vacuum suction cup) to position the component precisely on the corresponding land pattern. 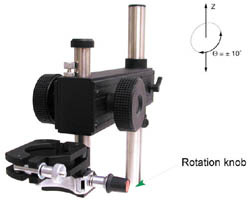 XK-2 - Tool Holder with up/down Z-axis movement (dual knob, for left and right-handed operators). Holds XHT-Series hot air tools and other equipment. XK-1 - Basic Tool Holder with up/down Z-axis movement (right-handed knob). 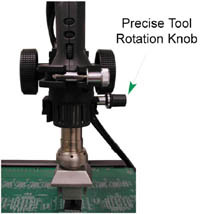 Lower limit adjustment knob provides repeatable clearance of an attached nozzle relative to the surface of a PCB assembly (Nozzle to PCB clearance). The XHT Series Hot Air Tool installation is fast and easy with quick-lock clamp. 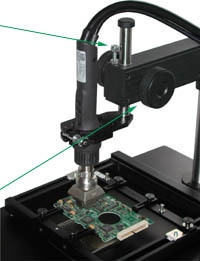 The XHT Series Hot Air Tool can be easily raised or lowered using Z-Axis Knobs (XK-1 has only one knob). Rotate a Z-Axis Knob clockwise to raise and counterclockwise to lower an XHT Series Hot Air Tool with a nozzle. XK-3 and XK-4 Tool Holders have a precise rotation stage to rotate Hot Air Tool and a nozzle by 10 degrees, clockwise and counterclockwise. Turn rotation Knob counterclockwise to rotate Hot Air Tool with a Nozzle counterclockwise. 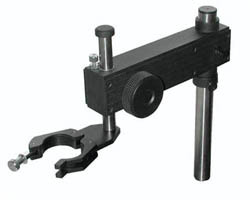 XK-4 Tool Holder will allow fine X-Y positioning of the Hot Air Tool and a nozzle by ±0.4” (±10 mm).